I don’t think I’ve always been that way, but I certainly have been for most of my adult life. And I’m going to wage a bet that you are too (at least a bit!) or you wouldn’t be reading this right now. In my first year of teaching, my perfectionism drove me to work every night until I fell into bed in an exhausted stupor questioning my very career choice. I soon learned that it was okay to not have everything planned out to the last detail and that in fact, sometimes it was a good thing to wing it! I guess at some point, I also realized that it was less important to be perfect, than it was to just be a good and caring person (or teacher) – and I’ve been working and focusing on that ever since. Now that doesn’t mean that my perfectionism doesn’t ever rear its ugly head. It just means that I bat it away and hush it as much as I can. What I didn’t realize (before I had my son in 2011), was that PARENTING was going to bring out the perfectionist streak in me – stronger than ever before. Almost as soon as he was born, that little annoying voice at the back of my mind started telling me that it was no longer good enough that I was good enough, my son also had to be. Are you suffering from this too? My perfectionist side wanted my son to be the quietest baby, sleep the best, and eat the best (Which was definitely NOT the case – but that’s another story!). That’s quite the list isn’t it? What kid could possibly live up to that? Well…of course the answer is no kid – not without acquiring multiple emotional health problems along the way while trying to, anyway! And of course, I realize this. Thank goodness. “Why isn’t he listening as well as the other kids?” calls the bothersome voice in gymnastics class. “Why can’t he sit still and answer the questions?” whispers the exasperated voice in the library group. “Why isn’t he socializing more with the other kids?” queries the paranoid voice at the daycare. And of course the mental comparisons never stop. “He’s really bright. He loves to read. I never have to ask him to pay attention when I’m reading,” gloats the irritating voice. “Hm…my son can’t ride his bike yet like the boy his age up the street. Why isn’t he more athletic?” worries the insecure voice. “Why is he so goofy and hyper sometimes? He’s going to have problems being serious when he gets to school,” predicts the foreboding voice. But that little voice is always there and it likes to compare. Have you heard it too? Taking sneaky pride in your kids being better behaved, or more mature, or intelligent than other kids. Or, whispering horrible things when your kids don’t measure up to the norm. Somehow their failures becoming our failures. And I know I’m not the only parent that feels this way. And then there’s the ever present desire for our kids to share in our interests and passions. You don’t need to look far to find examples of this kind of “parental displaced perfectionism” either. We all know the dad who is so caught up in reliving his glory days as an athlete, constantly watching and playing hockey with his son to the exclusion of other activities. Dreaming of the day when his son reaches the NHL. I know you’ve heard him yelling obscenities in the stands – haven’t you?! Or how about the mom who can’t wait for her daughter to become the ballerina she used to be – putting her daughter in a tutu before she can walk. Does this little girl even have a choice? Or maybe, it’s the grandparent that laments that not one of the children or grandchildren wants to take over the family business after all their years of hard work. A side order of generational guilt anyone? 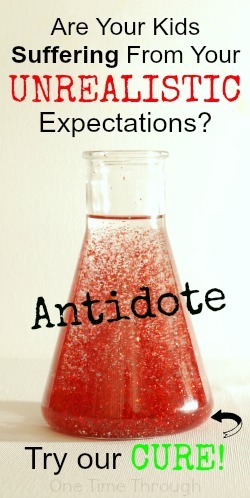 Finding the balance between having high expectations for our kids, wanting them to grow up to be responsible, considerate, and successful people, and allowing them to be themselves is tricky beyond belief, isn’t it? I know that I don’t want my son to ever believe that he’s NOT GOOD ENOUGH. 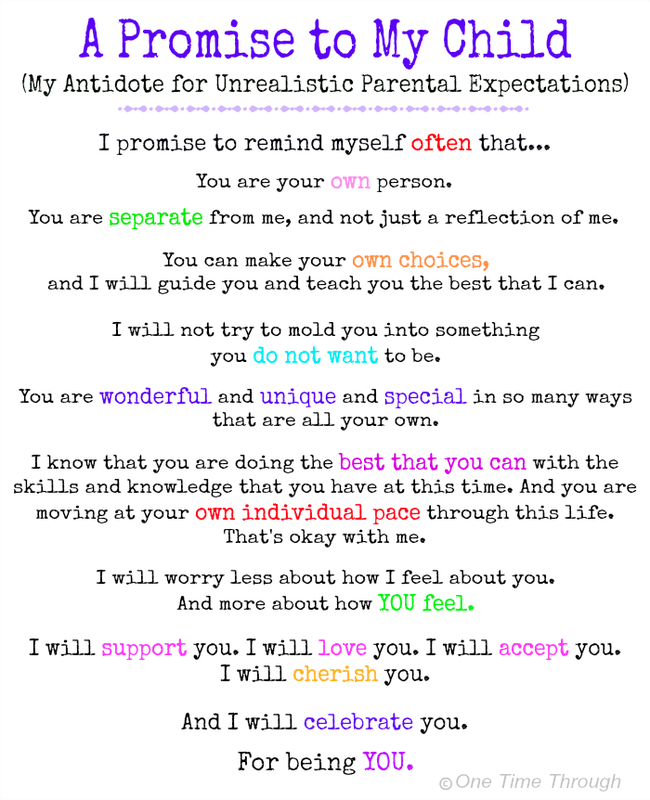 I know that I don’t want my son to feel like he’s disappointing me, just by being himself or for speaking his truth. And regardless of what that little voice in my head says, that’s what I CHOOSE to expect from my son. For him to be himself. 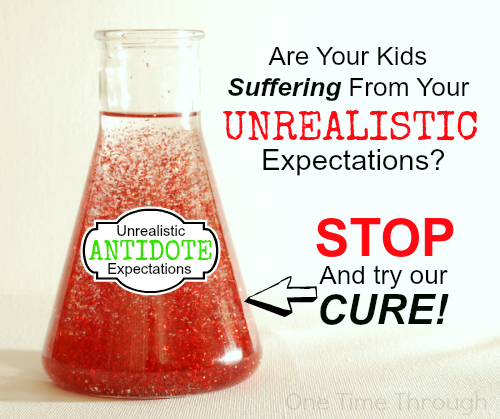 And THAT is my antidote for unrealistic parental expectations. Do you think it might help you too? If you would like a printable PDF copy of this promise, and are a subscriber, visit our Subscribers Only page to download your copy. Follow my Positive Parenting Pinterest board where all the posts will be added and where you will find all kinds of positive parenting resources from around the web! 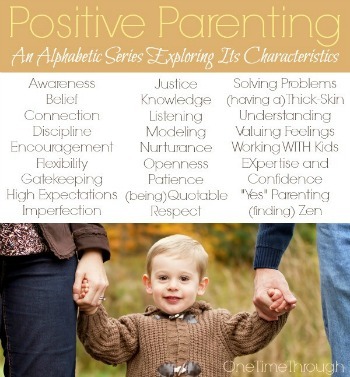 Thanks for joining us this week for our Positive Parenting alphabetic series. Our topic was H is for High Expectations. You can find all our series posts on the Positive Parenting Page.